In their paper “Tunnelling Through Intercorporate Loans: The China Experience”, published in the Journal of Financial Economics, professors Charles Lee, Jiang Guohua and Yue Heng said that controlling shareholders use intercorporate loans (or related-party loans), typically reported as Other Receivables (ORec), to siphon billions from listed companies. This “brazen form of corporate abuse” is called tunnelling, or insiders’ stealing of corporate wealth. While financial reporting standards recognise that such related-party transactions (RPTs) are a normal feature of business, cases of their abuse in expropriation abound. In the United States, a landmark case involved undisclosed related-party loans from Adelphia Communications to members of the controlling Rigas family. In Australia, related-party loans helped to facilitate the building and subsequent bust of the Alan Bond empire. During the 1997/98 Asian financial crisis, many firms that experienced the worst price declines had made related-party loans. Specifically, firms with unusually high related-party loans – measured by ORec as a percentage of total assets, or ORecta – are more likely to experience worse future operating performance, qualified audit opinion, share suspension, and regulatory investigation. The average risky ORecta measure is around 8 per cent (median 4 per cent). Thus, if a company’s ORecta were to jump abruptly from, say one per cent to 15 per cent in a year, it would be a red flag. An ORecta of 30 per cent would put the company in the highest risk group of insiders’ stealing of corporate wealth. Consider one such S-chip example. Sports shoe retailer China Hongxing Sports (CHS) is a former stockmarket darling with attractive statistics that included high net cash in the balance sheet, high profit margin (over 15 per cent) and high return on equity (over 11 per cent). Market value at its peak in October 2007 crossed S$1 billion. On Feb 25 2011, CHS shares were suspended with the shocking announcement that auditors Ernst & Young had uncovered irregularities in the cash and bank balances, accounts receivables, accounts payables and other expenses during the course of its audit of the China-incorporated subsidiaries’ 2010 accounts. Could this accounting fraud have been detected earlier? In one of the footnote disclosures of CHS in 2008, there was a sharp increase in “Prepayments, Deposits and Other Receivables” of 877 million yuan (S$192 million today). The ORecta measure jumped to 26.3 per cent in 2008 from 7 per cent in 2007. Most of the increase in ORec (or disguised related-party loans) was contributed by unsecured, interest-free loan advances to “distributors”. In other words, there was no collateral to offset potential impairment or non-repayment risks imposed on the minority shareholders. Importantly, the increase in ORec of 877 million yuan corresponds roughly to the rise in revenue of 843 million yuan. In 2009, ORec plunged by one billion yuan – and sales plummeted by 890 million yuan. The financial performance worsened markedly in 2010 with a plunge in cash and cash equivalents of 2.8 billion yuan until the unravelling in 2011. In short, the accounting transgression trace left behind roughly matched the changes in related-party loans and sales. The crux of the unsecured related-party loan problem is this: Changes in related-party loans or “investments”, should not (indeed, must not!) lead to revenue generated. Generally, only the sale of products or service performance would lead to revenue generation. The cash outflow of such related-party loans – disguised also as “advances”, “prepayments”, “deposits”, “amount due from/to subsidiaries”, “eliminations on consolidation of inter-segment balances”, etc – can be channelled to “set-up customers” who in turn engage in artificial sales transactions with the listed company, thus re-routing the same funds back into the listed company as “cash equivalents” to give the illusion that the balance sheet is healthy. In essence, we need a forward-looking system sensitive enough to detect accounting fraud before it happens and causes harm, based on the often-unread footnotes to prevent the siphoning off of corporate wealth via related-party transactions. This system will complement the “after-it-happens” post-mortem analysis of deficiencies in internal controls. Companies that are thus red-flagged can be grouped in a separate category on the Singapore Exchange website to inform and educate the public about the potential risks. This will help the investing public make better-informed decisions, as well as spur these companies to curb or unwind the fraudulent transactions. 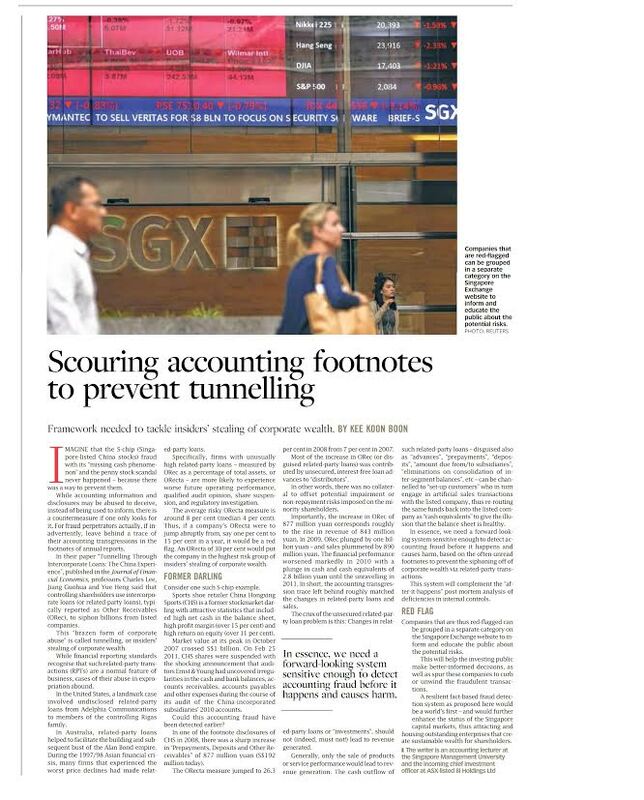 A resilient fact-based fraud detection system as proposed here would be a world’s first – and would further enhance the status of the Singapore capital markets, thus attracting and housing outstanding enterprises that create sustainable wealth for shareholders. Companies that are red-flagged can be grouped in a separate category on the Singapore Exchange website to inform and educate the public about the potential risks. ← Is Your Forward-Looking Statement Safe Harbor Safe? Federal Appeals Court Reverses Dismissal and Revives Securities Fraud Class Action; Harman International Industries knowingly and recklessly propped up the stock price by making materially false and misleading statements about the company’s financial condition. In April 2007, Harman announced its potential acquisition by a private equity firm. In September 2007, however, Harman announced that the acquisition plan had been abandoned.